Work is being down to make the GUI more responsive. <xmrmatterbridge> <rehrar> Hey everyone! I don't know if fluffypony will be here today, but let's see about getting this thing started. <xmrmatterbridge> <rehrar> tag all the people! <msvb-lab> nioc: I mean with the letters U-T-C to make it obvious. <xmrmatterbridge> <rehrar> Can we get a mini-update from dev, gui, hardware, and mrl? <xmrmatterbridge> <rehrar> So it's looking really promising that it'd be good for us? <xmrmatterbridge> <rehrar> MRL, folks. Let's give 'em a hand. <sarang> It was pointed out, though, that there's very little randomness hanging around, which could affect storing stuff "in the randomness"
<msvb-lab> MRL is excellent, nice. <xmrmatterbridge> <rehrar> Can we send them a fruit basket? <xmrmatterbridge> <rehrar> awesome. Thanks so much. <suraeNoether> multisig is looking like i will be ready to hand it off to sarang by the end of the month, as hoped. <xmrmatterbridge> <rehrar> Anyone else have an update since the last meeting two weeks ago? <xmrmatterbridge> <rehrar> can you summarize them? <hyc> we've isolated readline from GUI dependencies, etc. <endogenic> vtnerd says "oh good"
<xmrmatterbridge> <rehrar> FP confirmed he can't make it today. He sends his apologies. <moneromooo> And I think the rest is either prior to last meeting, or small/internal stuff. <xmrmatterbridge> <rehrar> Alright, awesome. Thanks moneromooo. <xmrmatterbridge> <rehrar> care to share something small about what's been going down? <msvb-lab> Hardware; we've settled our initial workflows and have built a twenty strong team. Journals are taking notice (see press) and the project is moving along. <msvb-lab> I'll mark our forum proposal milestone 1 as concluded today probably. <msvb-lab> I'll demonstrate our two current working protoypes at this week's first ever Monero Munich meeting. <msvb-lab> That's all, any questions? <sgp_[m]> What do you expect those who receive the prototypes to test? <msvb-lab> Very weak expectations, hopefully each finds their own way to contribute and strengthen the project. <msvb-lab> There's a test plan page, where people can make comments while testing. <msvb-lab> But that is just one of many choices, each individual can make on their own. <msvb-lab> Pretty lame answer no? <msvb-lab> Thanks for the opportunity. <msvb-lab> hyc: Who make most of the merges, fluffy? <rehrar> oh, right! so sorry. <rehrar> Anybody working on GUI have stuff to talk about. <rehrar> ok, no worries Jaquee. 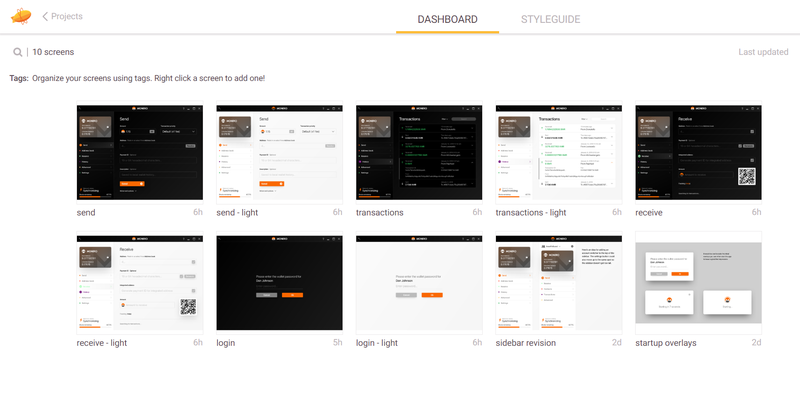 <msvb-lab> Is our GUI crew considered only monero-gui, or are mymonero.com and Moneruj (Android) included as well? <rehrar> dsc_ has what started? <msvb-lab> rehrar: So Monerujo communicate on a different channel, right? <rehrar> Monerujo utilizes the Mattermost where they have a private channel for the devs and core team, and a public channel for questions. They've also got a Taiga to track progress. <rehrar> yes, can you link your thread dsc_? <rehrar> The one you made a few days ago. <rehrar> in the comments there are the various proposals for redesigning the GUI. Are there any thoughts on any of those? <dsc_> seeing as I'm just one guy with zero QML experience, hehe. <dsc_> cant make any predictions as to when I have some tangible, taking quite some time...! <msvb-lab> dEBRUYNE: Is Qt5 easy to port to mobile? <rehrar> Alright. That's it from GUI? No other opinions on dEBRUYNE and dsc_ stuff either? <rehrar> hyc moneromooo can you two take the lead for this? <moneromooo> Well, if anyone has questions about them, please ask. <dsc_> ticket Q/A != discussing open PR's, right? <rehrar> Alrighty, shall we move on? <Slack_3> <serhack> Is there meeting? <rehrar> The idea of having a set of formalized guidelines for FFS proposals going forward has been thrown around a lot. It'd be good to get some opinions on how this is laid out and any concerns that may arise from it. <xmrmatterbridge> <serhack> I didn't understand well: is the project funded by ffs an Official project? <ArticMine> Does the current system work? <rehrar> There's been hiccups ArticMine. fireice and guzzi come to mind. <rehrar> Largely based on de facto expectations that are not actually formalized. <endogenic> but if the situation is not able to be recognized by ppl then how can it be applied for the desired result? <rehrar> since we've got that right now, maybe we stick with it? <rehrar> This has not been formally replaced, so it is currently active. We can discuss that at a later time though. Let's move on. <moneromooo> If anyone wants to test multisig, feel free. PR 2134. <gingeropolous> is there a set date for the next code freeze? <xmrmatterbridge> <serhack> So we (I and cryptochangements) are going to release Magento Plugin, In the past few weeks, we worked on a new cool payment box for Monero Integrations. <xmrmatterbridge> <serhack> I am currently working on OpenCart too so I think we can release Magento payment box the next week..
<rehrar> doesn't he still run Dwarfpool? <rehrar> December 3rd? Same time? <gingeropolous> so no freeze date, eh? <rehrar> Should we move time because daylight savings? <rehrar> FP would have a better answer? <hyc> isn't a release due in January? <rehrar> There's a new freeze/release schedule isn't there? <moneromooo> It's branch, then release from the brnch aftrer 2-3 months. <moneromooo> It's already painful when stuff doens't get merged after a month. <moneromooo> That's not likely to be ready by then. <msvb-lab> rehrar: Thanks, good flow of topics, great moderation.